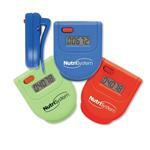 One of the best selling promotional pedometers! Comes with a button cell battery inserted, energy saving auto shut-off and idle mode, secure clip and of course your custom logo. 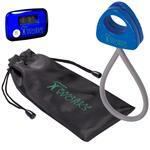 Measures up to 99,999 steps, distance and calories burned. 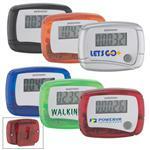 A top selling promotional pedometer! Dimensions: Item Size: 1-3/4" x 1-3/4" x 1"
Typical Imprint Area(s): 0.875" x 0.625"
Box Size: 24" x 14" x15"